We have so many patients who come to our office and say, listen Dr. Jasmine, these dentures are just not comfortable, and they come loose whenever I eat food. In these cases, Dr. Jasmine may recommend implant supported dentures. What are implant supported dentures? They are dentures that snap into dental implants to give you a more firm and comfortable experience with your dentures. This will allow you to chew your food comfortably and not have to worry about your denture coming loose in public. We know that having a denture can be a hassle, and more so for lower dentures due to the powerful tongue muscle that can dislodge your denture at times. That’s why Best Dental has decided to allow patients to comfortably afford two lower dental implants with a custom-made lower denture for the price of $4,000. Most dental offices in and around Houston will charge this much (if not more) just for a single dental implant. We want to make sure your dental experience is not only comfortable, but financially reasonable as well. If you are looking for affordable dentures in Houston, the you have picked the right office for you. Below you will find some common questions about snap on dentures. 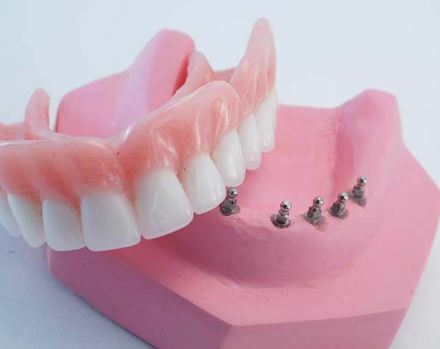 If you have any further questions, or would like to inquire about these dentures, give our office a call. What are snap on dentures? These are dentures that lock onto dental implants that are placed in your jawbone. They will allow for a strong grip between your dentures and the implants so that they don’t move around on you while you are eating. How are snap on dentures made? Unlike traditional dentures, snap on dentures have 2-6 holes underneath them. 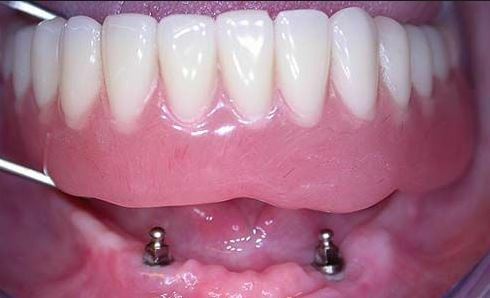 These holes allow the dentures to snap into your dental implants, so that the implants can support them during the day. How do snap on dentures work? The denture snaps onto magnetic connecting points called locators that are attached to the dental implants on the sides of the inner jaw. This option means more stability inside of your mouth, and many patients feel more much comfortable than with their traditional dentures. How do you remove snap on dentures? The easiest way to remove them is by putting on medical gloves to give yourself a good grip as these dentures are secured very well by the dental implants. Just a little pressure should remove them fairly easily. How secure are snap on dentures? Snap on dentures are very secure. Once they have locked into place they hardly move around at all allowing you to function without the worry of your denture coming loose. Are snap on dentures removable? Yes they are. These are not hybrid dentures which are a permanent. Some patients will not qualify for the hybrid dentures option (a fixed permanent option), so this will be their next best thing. Don’t be fooled. You dentures will be very secure with this option. What do snap on dentures cost? For two lower dental implants and the denture our cost is $4,000. When you start dealing with more implants the costs may vary due to the complexity of the case. During your consultation appointment, Dr. Jasmine and her team will let you know exactly what your costs will be. Can you eat with snap on dentures? Not only can you eat, most traditional denture wearers will eat better than ever before. No more worrying about the dentures coming loose while you are eating. When your dentures “snap” into place, you will realize the secure feeling that you probably hadn’t felt in a long time. How long do snap on dentures last? Snap on dentures can last as well as you take care of them. Long term, there will be times where the dentures have to be adjusted, or when a locator must be replaced. Regular visits to your dentist is an absolute must to make sure everything is functioning properly. Will I need a bone graft prior to getting my snap on dentures? If your jawbones lack the proper amount of bone for an implant to be placed, then yes, a bone graft may be necessary. How do you clean your snap on dentures? You will need to clean your Snap in Dentures every night with soap and water. Please, do not use any over the counter dentures pills or cleansers, and avoid scrubbing them. Please place them on a dry towel after your are done cleaning them to avoid falling and breakage of the dentures. Can you sleep with snap on dentures? Yes you can. It’s really a personal choice, but make sure your keeping your dentures clean on a regular basis. What if my snap on dentures break? Please avoid gluing or trying to repair the denture yourself. Make an appointment with Dr. Jasmine so we can repair it either at our office or with our laboratory. Attempting to fix it yourself can do more harm than good. Should I wash my mouth and my implants? Absolutely. Use toothpaste to keep your mouth clean, and Dr. Jasmine strongly recommends getting a water pick (pressurized water) that will keep your mouth and the implants clean between your regular visits to our office. What do snap on dentures look like? Will I notice a big difference between snap on dentures and my traditional dentures? You will notice a dramatic difference in stability and chewing comfort. We want to make sure that you are fully educated about snap on dentures before you commit to them. There will be a learning curve to wearing them, and for traditional denture wearers, it may feel strange how stable these new dentures are. If you have an interest in snap on dentures or any other form of dentures that we offer contact Best Dental today! Our office will contact you to schedule an appointment or discuss any questions you might have.